Any road for us, after sitting in Atascadero since April 1st. We have met hundreds of RV travelers and so many are surprised that we drove the MotherShip to Alaska. We did an Internet search on "what percentage of RV owners have been to Alaska". We could not find any site that even guessed. What we did find was the Alaska Visitor Statistics Program VI Interim Visitor Volume Report Summer 2015. It stated that 1,780,000 visitors came in that summer. Only four percent (66,200) came by highway which includes all vehicle types. According to the RVIA Recreational Vehicle Industry Association there were 8.9 million RV owners in 2011 (the most current stats available). Using the 2011 number, less than one percent of RV owners visited Alaska. 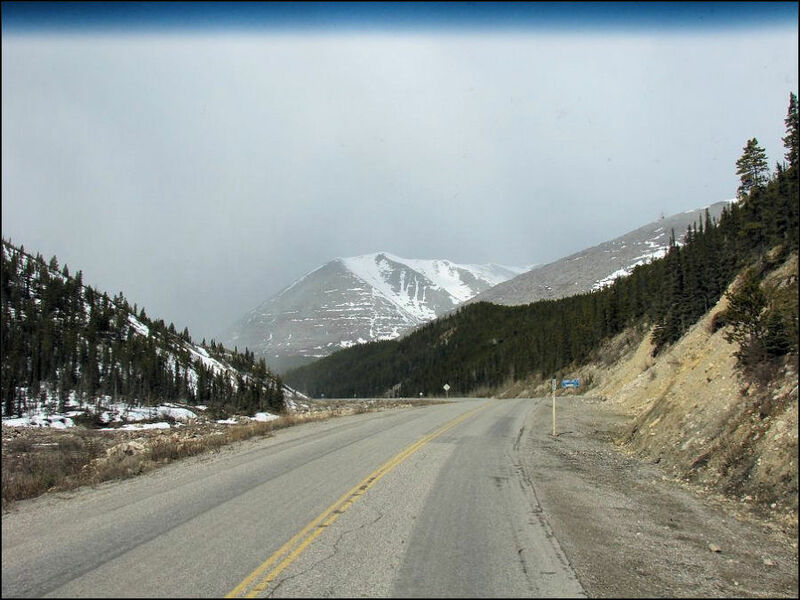 We feel pretty confidant that the Alaskan Highway is THE road less traveled. 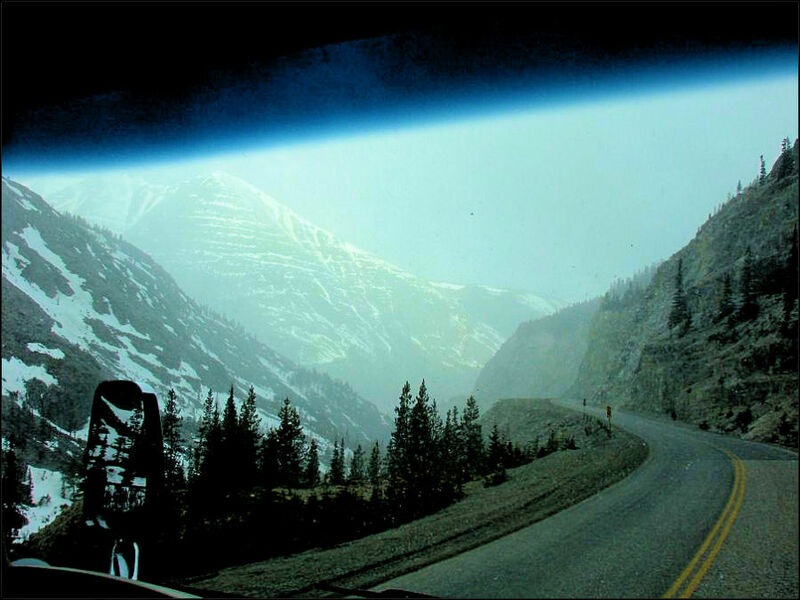 Shown here is the 1,390 miles Alaska Highway as we traversed it in 2009. Those who have not gone to Alaska by RV should ask a number of questions, such as: Is it the last frontier of the USA? Is it incredibly beautiful? Is it the best trip you have ever taken? Is every photo you take a "post card" or should be on a picture puzzle? Are the people the most hospitable you have every met? Does the freedom remind you of the 1950's? Do you want to go again? The answers to all these questions is Yes. Or they could ask: Did you meet any Alaska resident who wants to move to the lower 48 states? Do you wish you would have flown or taken a cruise instead of driving your RV? Do you wish you would have traveled with a tour company? Was two months in Alaska too long? The answer here is No. But what so many RVers ask is "aren't the roads just awful?". Our answer is that in 2009 the roads were the best in America. Take a look. The Alaskan Highway starts in Dawson Creek, British Columbia. If you don't know which way to go, the statue will tell you. The original 1,700 mile road was built in 1942 in eight months. It took a tank or aggressive 4-wheel drive vehicle to pass. By 1943 it was usable by general vehicles. It was open to the public in 1948. In the 1980's the entire road was paved. By 2012 the original very-crooked road had straightened enough to shrink the total mileage from 1,700 to 1,390. The condition of the road will vary from year to year because of winter weather. The frost heaves can push up sections of the road into waves and even break the road. The road crews are always on top of this as tourism makes up a vast portion of the Alaskan economy. 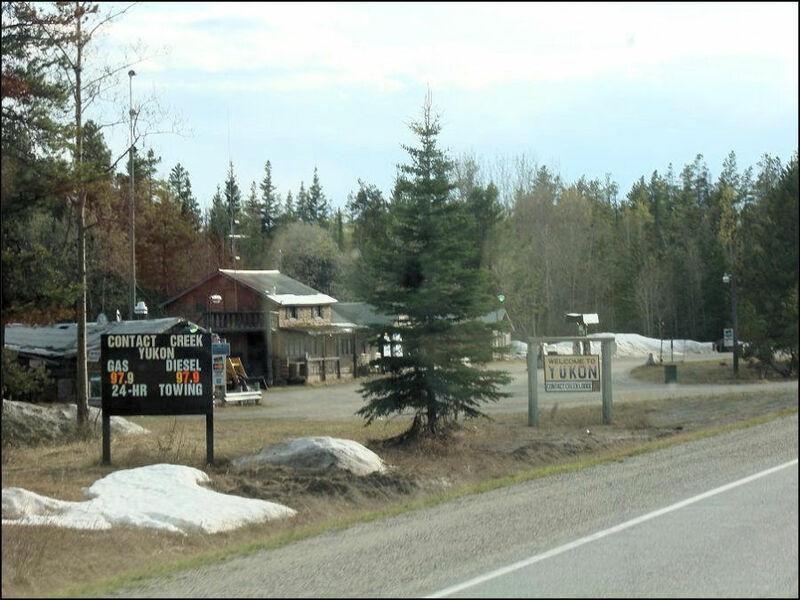 1) Passing through Fort Nelson you can stop off and tune up your curling game. 2) Moose are shy but this one came to the road as the snow melted and food was available. We started our trip on April 30, 2009. We recommend that you start as early as the roads are cleared and the snow has stopped or is light and intermittent. We had the highway to ourselves. When we spotted any animals we just coasted the MotherShip quietly to a stop and got great photos. Once bored of taking photos, we slowly moved on. We saw our moose on May 14, 2009 at 8:53 in the morning. As we continued our travels on May 14th we saw many more animals as you will see. After passing across this bridge we hit our first stretch of gravel. It was only one mile in length. The road crews would have paved it over soon. Still on the 14th we saw caribou at Summit Lake at 9:23 am. Toad River is typical of the "road houses" you encounter. These stops are 50 to 100 miles apart. So you need to plan carefully to avoid running out of fuel between road houses. 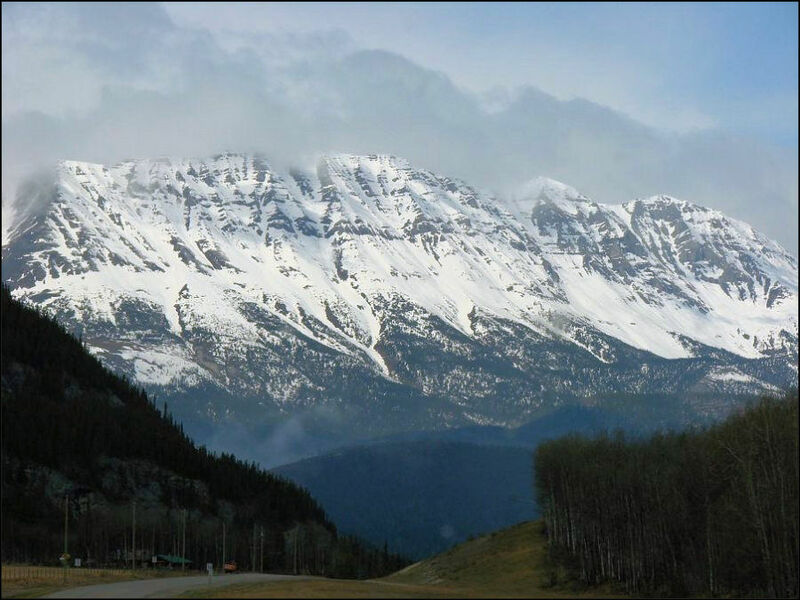 You get great views of the Northern Canadian Rockies as you travel the highway. Muncho Lake is gorgeous, but as we approached a light snow fell. However the lake is long enough that the weather cleared for us before we passed. 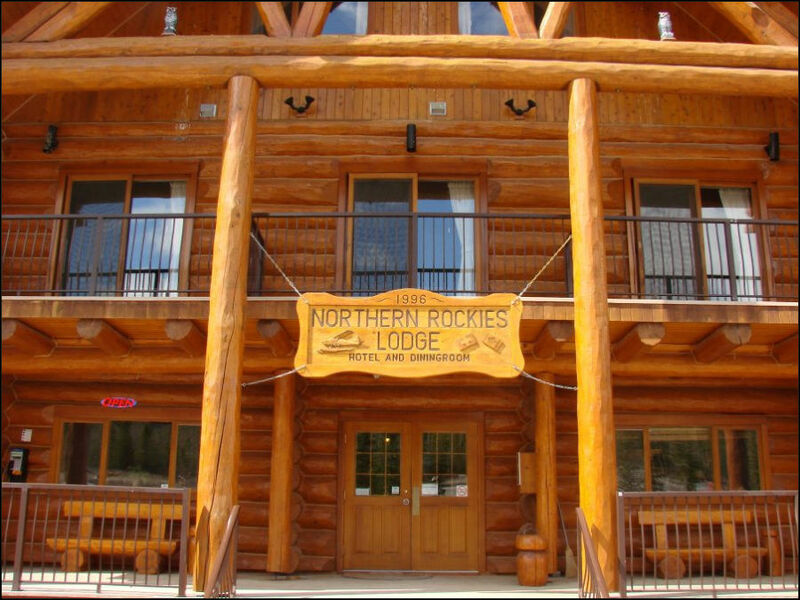 Northern Rockies Lodge stands out for its freshly built look, although it was 13 years old in 2009..
Again on the 14th we stopped to view the lodge. The snow canvas for Pete's message almost melted off in just five minutes. Trout River on the way to Liard Hot Springs. Liard Hot Springs is a must visit. Ponds with temperatures from 108 to 126 degrees farenheit are a refreshing rest stop. Leaving the springs we encountered a herd of bison ( still May 14 at 4:51 pm). While the speed limit is 100, we kept it slower. Good thing as just 28 minutes past the bison was this bear. The animals seem to keep to their own areas. We're not sure but we think this is the Liard River frozen over. So beautiful! We stopped at Contact Creek, Yukon to fuel up. Who could resist the price of only $97.99. Oh no! It turned out to be per liter! And yeah, speed limit 100 is in kilometers, about 60 mph. Still moving along on the 14th we saw wild horses. So in a single day we saw moose, caribou, bison, bear and wild horses and almost no traffic. This is living the dream. 1) We just had to show this private RV park in Watson Lake, Yukon. The sites are closer together than most Elks Lodges we have stayed at. But, they had cable TV with 10 channels! 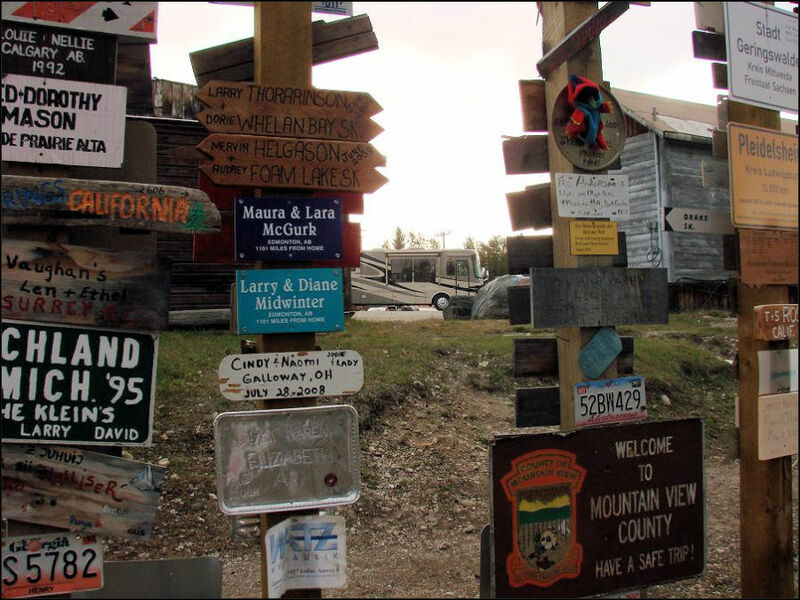 2) Watson Lake is home to the Sign Post Forest featuring over 65,000 signs from around the world. We forgot to bring our crayons so no sign for us. But, wait until our next Alaska trip, we'll be prepared. 1) The second and last gravel patch we hit was two miles long. So in 1700 miles only three miles were gravel in 2006. 2) You can see an example of how the frost heaves lift the road. These were not a problem being parallel to the road. The Nisultin Bay Bridge takes you across the bay and into the town of Teslin, Yukon. 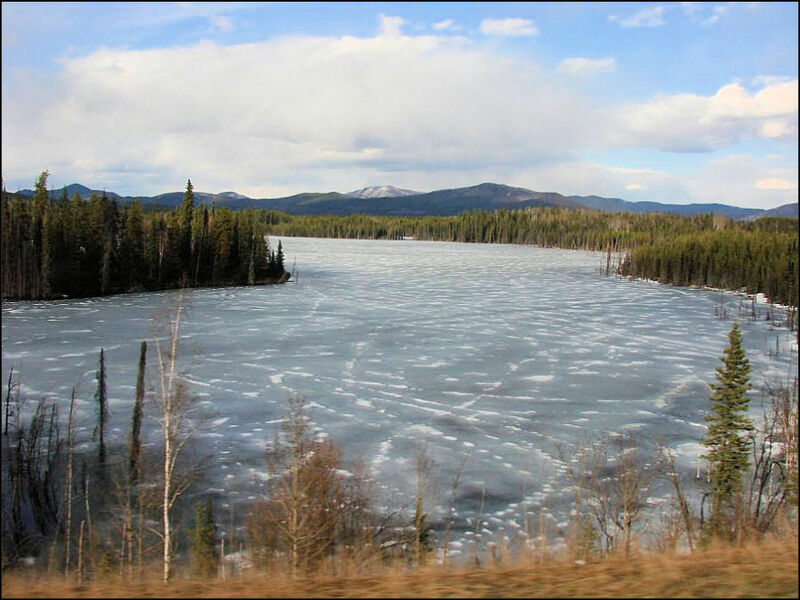 Teslin Lake is about 3 miles at its widest and 75 miles long. You are never far from water when you travel through Canada and Alaska. The weather in 2006 was great. Pete wore shorts most the time. Ellen? Not so much! Why is she so happy? It is because we were headed to Klondike Rib & Salmon in Whitehorse, Yukon. Throughout Canada and Alaska we tried Halibut more than a dozen times. Klondike R & S was the best. The lowest price, the largest servings and the thin beer-battered fish was outstanding. So good, in fact, that we made detours to come back two more times. We even did a photo ad testimonial for them. All highway visitors to Alaska must go through Tok. We met our SOWERs friends from San Diego in Tok. We followed them to the end of the Alaskan Highway in Delta Junction, Alaska. 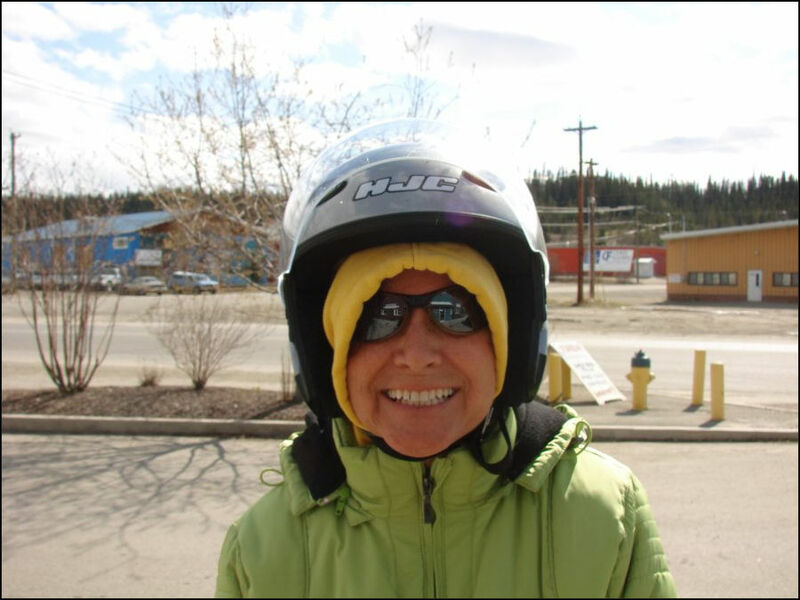 Before meeting our friends and after eating halibut in Whitehorse we took a 831 mile trip to Dawson City, Yukon, across the "Top of the World" highway and on to Tok. We picked up a little dust. There is 33 miles of gravel on the Yukon side and 30 miles in Alaska. Every Alaska tour guide says "you must see the Top of the World highway". We disagree, skip it unless you like bragging and a lot of dust! Now back to the SOWERs. Our friend John wisely asked if we had cleaned our air filter. We had not. John pounded out a 1/2 thick band of dirt along the top of an eight foot railroad tie. Then he used his compressed air to blow out a cloud about the size of the MotherShip. Hmmm! We should check the filter more often. 1) Kluane Lake is the Yukon's largest lake and quite lovely. 2) We however scooted by and stayed at our own private Sulfur Lake. We had the lake all to ourselves. 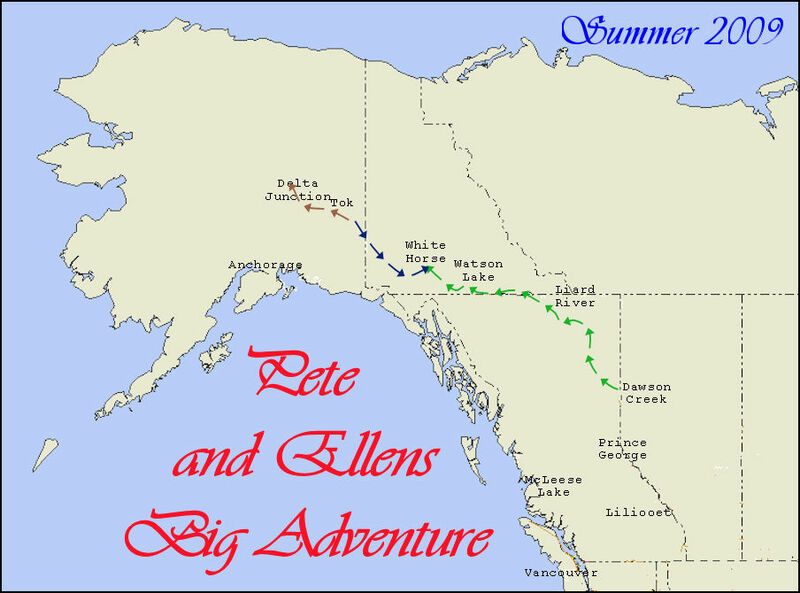 This was a clue we read in "The Mileposts", the must-have guide to Alaska. Whether you are fishing or relaxing, having your own lake is great. There are 3 million lakes in Alaska and less than 1 million residents. Even with 66,200 wheeled visitors you can still find your lake. The last leg (for us) of the Alaskan Highway from Tok, Alaska back to Whitehorse, Yukon. 1) Yes these are bicycle riders. Did they ride to Alaska from the lower 48? We don't know but we did meet other bikers that were completing that journey. 2) The last section of the highway that we drove from Sulfur Lake to Liard before turning south on the Cassiar Highway. So you be the judge. Is this the Road Less Traveled? It was for us. But, more importantly it is a fabulous road that they work on constantly to keep it in top shape for you and me and our RVs. Most damage comes not from the road but from passing trucks that spray your RV with gravel. We had not a single problem from the road. Then again we started out in April before anyone else. And we stayed off of gravel roads during traffic time. But even if you receive some damage, don't let it stop you from enjoying this best ever Big Adventure.